Summary: Notes taken from the newsgroup for what is important to users for drafting tools in Rhino. Feel free to add your own comments, but please please please leave your name so we can contact you with questions. 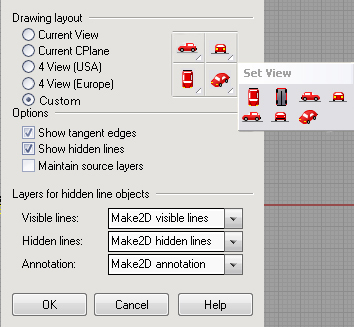 Maybe base the entire drafting layout system on Google's SketchUp layout system? SketchUp is quite awesome, but uses polylines or splines opposed to bezier or NURBS. It would be awesome to see a hybrid software such as Rhino/SketchUP!/CorelDRAW/Adobe Illustrator. All imports and exports could be bezier curves opposed to splines. Great for machine output which smooth results. Make it all parametric while you are at it! Wish – PrintWidths by color (KeithWilkinson, ChrisMoor). This can probably be implemented with a script that rips though geometry and assigns weight based on current color. Continuous dimensioning ability to draw (and constrain) all dimension-lines in one axis, without calling the command again and again. (HolgerJahns, DonCulp, DanBayn) Partitioned? (DonCulp) What does that mean? Text Curning (to make text wider or taller than default). Support for SHX fonts, to get thin text or text by line weight (faster performance too). This is from DonCulp. Not quite sure yet what this means. We do not have artistic (gradient) hatches yet. (Undo) command within hatch to undo last hatch if it is not what you wanted because of un-closed boundary geometry. I changed the 2-D Drawing Options menu in Photoshop. Or you may consider the way SOLIDWORKS or Unigraphics does it. Can text be underlined using Windows font object techniques? Maybe DXF or dwg coming in could be translated to this, too…..
A plug-in to export a page layout as a single AutoCAD compatible dwg or DXF, steam-rolled flat would be very useful. The next question immediately will be can it be done at model scale if you know the detail view scaling, instead of paper scale? (Choose Detail to base it on maybe.) This is possible in other MCAD programs and is very useful for manufacturing, but also for sharing drawing details complete with notes, etc. with AutoCAD. A block catalog that allows visualization of the blocks to the side of the page layout would be good. It can be done now using the Rhino thumbnail viewer plug-in for Windows and dragging them to the page layout, but it is inconvenient from a production drawing standpoint.